It’s never too late to slow down, or even reverse, the effects of aging. It is this theory that led Miranda Esmonde-White to create Essentrics – Classical Stretch – viewed as a very powerful technique for weight loss and strengthening. Essentrics increases flexibility; rebalances joints; relieves back, knee, shoulder, hip and foot pain; and much more. Done in as little as 30 minutes a day, countless people have benefitted from this technique developed by the former National Ballet dancer. The Esmonde technique is the foundation of Essentrics. In her new book Aging Backwards, Miranda Esmonde-White explains exactly how and why the Eccentrics approach is so powerful and how you can use it to slow down and reverse your own aging process. The book takes you through the full cycle of understanding the aging process. Why in our forties do physical changes pop up that make us feel “old” and how to fight them head on? Aging Backwards also highlights eight age-reversing workouts. Essentrics not only reconnects you with your body’s innate strength and grace, but it also reconnects you with the joyful pleasure of movement. Some benefits include: increased energy, smoother and firmer skin, and eyes that sparkle. Like Miranda Esmonde-White, you can even in your sixties live a pain-free, energetic, and strong life. Look stronger, happier and healthier well into your golden years. ARE YOU SEDENTARY?A lot of people think that if they work out once a day, they’re “active” – even if they sit at a desk all day. Not true. Studies show that sitting too much is literally deadly. Aging Backwards recommends that you take every opportunity to stand when you can. Whether you are reading a memo or talking on the phone. The misconception is that when we get older we need to take it easy. Strengthening and stretching all the 650 muscles in your body, is one way to enhance your overall health and mobility. 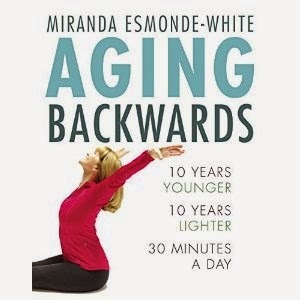 Miranda-Esmonde-White shares her knowledge on how to keep your body young and also shows illustrates the stretches that will help you love life as you age.